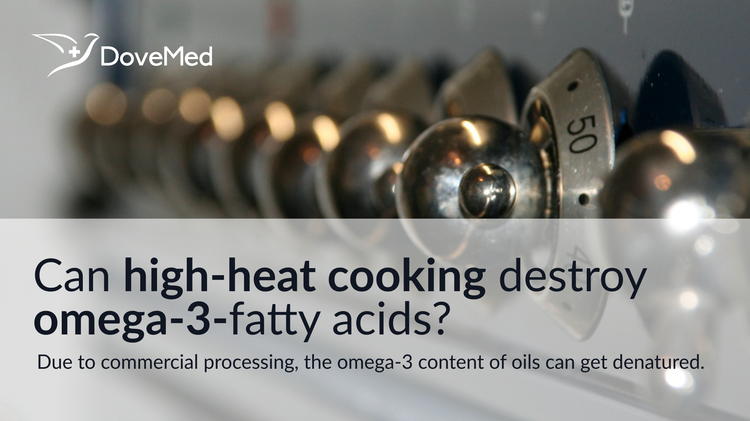 Can Omega-3-Fatty Acids Be Destroyed By High-Heat Cooking? One study research found that frying tuna destroyed nearly 80% of the omega-3 fatty acids in them. Omega-3-fatty acids are also known as n-3 fatty acids. They are polyunsaturated fatty acids and are associated with many health benefits. According to a study published in 2001 by the American Medical Association, eating fish high in omega-3-fatty acids has significant health benefits. They promote anti-depressant and anti-inflammatory effects, improve mental skills in children, and reduce the chances of thrombotic infarction, which is a kind of stroke where a blood clot clogs an artery in the brain destroying brain tissue. Ocean fish are the richest sources of omega-3-fatty acids and such fish include tuna, salmon, and mackerel. Omega-3-fatty acids are also found in other forms of seafood. There are three types of omega-3-fatty acids in the food we eat: Alpha linolenic acid (ALA) and eicosapentanoic acid (EPA) and docosahexanoic acid (DHA). ALA is found in walnuts, rapeseed, soybean, kale, Brussel sprouts, spinach, and flaxseed. EPA and DHA are found in fatty fish. Inside the human body, ALA is partially converted into EPA and DHA. Due to commercial processing, the omega-3 content of oils can get denatured. The oils are heated to high temperatures in order to refine them and are further heated during cooking. Deodorization is a step in the process of oil refining, wherein the oil is passed through a series of heaters and the temperature is increased to around 200 degrees Celsius for efficient steam distillation. At temperatures as high as this, the basic structure of the oil is changed into a form that can be harmful for the body. The process of change in the structure of the fatty acid is called isomerization. Cooking fish rich in omega-3-fatty acids needs some care. According to the National Fisheries Institute, low-fat cooking techniques such as broiling, steaming, poaching, baking, stir-frying, sautéing, and grilling are recommended; overcooking should be best avoided. To get the best out of food, one should cook until the point of ‘doneness’. Deep-frying is not advisable as it can destroy omega-3-fatty acids and also add more fat to the food. One study research found that frying tuna destroyed nearly 80% of the omega-3 fatty acids in them. Exposure to high heat causes the formation of some trans fatty acids. After exposure to steam and subsequent filtration, the oil becomes colorless, tasteless, and odorless. In this form, it can be kept in a bottle for a long period of time without the fear of spoilage. However, it no longer has the original health benefits, since most of the omega-3-fatty acids have been destroyed. Consuming this “plastic fat” has no beneficial effect on the body and should be avoided in favor of olive oil, coconut oil, avocado oil, and grass-fed organic butter. Hence, it is wiser to consume boiled or baked fish that help preserve the omega-3 fatty acids. Omega-3 fats found in other foods like flaxseeds, kale, or spinach may be preserved by consuming them fresh, as part of salads. Sebedio, J. L., Ratnayake, W. M. N., Ackman, R. G., & Prevost, J. (1993). Stability of polyunsaturated omega-3 fatty acids during deep fat frying of Atlantic mackerel (Scomber scombrus L.). Food research international, 26(3), 163-172. Rudin, D. O. (1996). Omega 3 oils. Penguin. Moore, R. L. (2009). Antioxidant protection of an omega-3 fatty acid fortified dairy-based beverage (Doctoral dissertation, Virginia Tech). Covington, M. B. (2004). Omega-3 fatty acids. Atlantic, 1(2.0). Schmidt, E. B., & Dyerberg, J. (1994). Omega-3 fatty acids. Drugs, 47(3), 405-424. Cherian, G. (2008). Omega-3 fatty acids. In Wild-Type Food in Health Promotion and Disease Prevention (pp. 169-177). Humana Press.